The original leopard horses of the Americas apparently came with the Spanish explorers in the sixteenth century. But were any of them leopard-marked Barb horses? Early records suggest that the first horses brought to the Americas were a combination of breeds and types, but most were what today would be called Andalusian. They were powerful horses, not very tall, with heavy manes and tails, and the stallions had thick crests. The Spaniards also brought Lusitanos from Portugal, African Barbs and gaited Spanish Jennets. There may have been some Arabian mixed in, along with other types of European horses that were developing into breeds at that time. Four hundred years later, by 1945, the Appaloosa (which included varnish roans, leopard-spotted and blanket-patterned horses) was well on its way to becoming established as a separate breed in the United States. It was generally believed that these spotted coats came from the Spanish Jennets and Andalusians, but some people thought that spotted Barbs also contributed colour to the new breed. Traditionally, Barbs were solid coloured, not spotted. Were there ever any leopard Barbs, and was there a new infusion of leopard bloodlines directly from Africa just prior to the founding of the Appaloosa Horse Club in 1938? In June 1947, in an article in a magazine called Bit and Spur, author by A.M. Hartung claimed that Mr. and Mrs. Jack Meeker of California had actual Leopard Barbs. The story goes that Mrs. Meeker's uncle, John B. Seiley, imported imported a Leopard Barb stallion and mare named Desert King and Sudan from Tunis, the capital city of Tunisia, in the late 1930s. Both were supposed to be “pure desert-bred Libyan Leopards” that were spotted nose to tail to hoofs. When bred together, these two horses produced the well-known leopard Appaloosa foundation stallion Arab Toswirah Alkhar, who in turn sired the leopard stallion Siri Sheik. These stallions were about 14.2 hands tall and about 950 pounds. The breeding program was taken over by the Meekers, who were determined to maintain the Leopard Barb bloodline as much as possible. But was it true, or just a great marketing ploy? There is another tale told that says the Hoffman Leopard Ranch had two black leopard stallions, a father and son named Jazzo and Jazzo II. Author Mary Hare and American Leopard Ranch owner Frank Scripter researched these two horses and discovered that there was some name-changing going on after the horses were sold. According to Hare, the stallion Desert King was foaled in 1923 out of a mare called Sol Rayna, who was imported by a Maria deRojas from a man in Argentina named Don Russia. Desert King was sold several times and at some point was renamed Jazzo. Jazzo (a.k.a. Desert King) was bred to a brown blanket Appaloosa-type mare called Sudan, who was by an Arabian stallion named Alkhar and out of a black leopard mare named Desert Jewel. The Pedigree Query website lists both of Sudan's parents as Argentine-bred. The black leopard Jazzo—Sudan colt foaled in 1935 was named Jazzo I. He sired Jazzo II out of an Arabian mare (possibly named Desert Viente) in 1938. Both were owned by Ernest (Oscar) Eichenbrenner, who changed the names from Jazzo I to Arab Toswirah Alkhar and Jazzo II to Siri Sheik. These two stallions were sold to Chris Stover, who reportedly created the “Libyan Leopard Barb” story for them (which he later recanted). Frank Meeker then bought both horses, which were inherited by his niece, Betty Meeker, who sold them to Jim and Irene Hoffman. The horses were advertised as “The Famous Hoffman Libyan Leopards” and appeared in many parades. When illness forced the Hoffmans to sell the pair, the horses were split up and were registered by their new owners as Arab Toswirah Alkhar and Siri Sheik, but with incorrect birthdates. Extensive research in later years by the late Dr. Francis Haines could find no connection in their pedigrees to Libya, Tunisia or Leopard Barbs, but he did discover Desert King's true lineage. He was by Pharoah out of the Argentinian import Tavisheen. Pharoah was by Blue Hawk, by Winged Hawk out of a black leopard mare. Winged Hawk was by Spotted Eagle (1860). There is a photo (see American Leopard Horses, Part 2) of a handsome leopard horse labelled by some people as Tavisheen and by others as her son Desert King. It is unknown which of these two horses is the one in the photo. There is a third story about these horses, and it closely matches what Dr. Haines discovered. Author Don LaLonde (author of The Story of the Ghost Wind Stallions) wrote that a Ghost Wind Horse named Fire Eyes was foaled in Idaho around 1840. He sired the Ghost Wind Horse stallion Spotted Eagle around 1860, who in turn sired another Ghost Wind Horse, Winged Hawk, born around 1872. Winged Hawk was owned by a man named Howling Elk, who entrusted his grandson, George Long Grass, with the horse. George took the stallion all over the western states, into Canada and east to Chicago, with the stallion being used for stud duty at every stop. The stallion died in 1898, and his last Ghost Wind son, Blue Hawk, was born after his death. George Long Grass sent Blue Hawk to California, hoping the horse would carry on the Ghost Wind Horse bloodline. Blue Hawk ended up at Desert Wind Ranch, where he was bred to Arabian mares. He sired the next Ghost Wind Horse, The Pharoah, in 1918. The Pharoah was bred to an Argentine black leopard mare named Tavisheen, imported from Mexico (not Argentina), and she foaled Desert King in 1923. His name was later changed to Jazzbo. In 1935, Desert King (a.k.a. Jazzbo) sired Arab Toswirah Alkhar, later renamed Jazzbo I. In 1938, Jazzbo I sired Siri Sheik, also known as Jazzbo II. Note the similarities in name. One story calls the horses Jazzo, the other Jazzbo. George Long Grass died in 1952. Arab Toswirah Alkhar (Jazzo I) ended up as a research stallion in colour studies being done by Dr. Joseph W. Hewko. His coat pattern was described in this way: the spots were all black on a pure white background; the spots were quite uniform in size all over the entire horse; the spots were evenly distributed over the coat; the spots were mostly round, with some teardrop or oval; there was no handprint pattern; and on the neck, there was a halo effect around the spots varying from a fine line to an inch wide. The stallion's spots were also almost the same on both sides, as if one side was a mirror image of the other. Dr. Hewko discovered that Arab's spots, including the skin pigment under them, changed dramatically in the course of a year, from black to white to brown to black, always cycling back to the original colour and pattern. But instead of the whole horse changing his spots at the same time, each spot seemed to be on its own individual cycle, changing over the course of 10 to 16 weeks. The spots always remained constant in size and shape and the overall leopard pattern never faded or changed as the horse aged. Dr. Hewko had no answer for why this occurred. Arab Toswirah Alkhar died in 1962, but his bloodline lives on through his son Siri Sheik and his many descendants. Arab Toswirah Alkhar's son, Siri Sheik (Jazzo II), was actually registered before his sire. Known for his beauty, incredible good health and soundness, Sheik was a superior sire. He helped found many Appaloosa and Pony of the Americas breeding programs and his offspring in both breeds won numerous national championships. 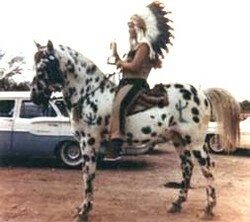 Siri Sheik produced Appaloosa horses in every colour, including the black leopard Pepper's Shamrock, foaled in 1957. Shamrock was an excellent sire and continued the bloodline through his most notable son, Money Creek's Rockledge, and many other excellent sons and daughters. Shamrock's line lives on in many Foundation Appaloosa breeding programs, especially those devoted to producing the leopard coat pattern. The late Frank Scripter crossed Shamrock and Rockledge daughters with his beautiful leopard stallion, Chub's Powderface, to create a line of leopard horses that continues to this day. Something else Shamrock passed on was his gait — he was an Indian Shuffler. The Indian Shuffle is a version of the running walk and goes all the way back to the ancestral Spanish Jennets. It was once common in Appaloosas, but nearly disappeared in recent times due to so much crossbreeding with non-gaited Quarter Horses and Thoroughbreds over the past 80 years. Whatever the true origins of Siri Sheik and his sire Arab Toswirah Alkhar, both were instrumental in the establishment of the Appaloosa breed and the American Leopard Horse and helped ensure that the true leopard colour would not be lost. Very interesting and a beautiful horse. I know nothing about horses, but I've been wanting to learn. I'd like to find a place where I could volunteer so I could learn about them. Really good! Hope you didn't get a headache trying to keep all of that straight! Goodness! !